A mere 80km from Paris is one of the most famous gardens in the world, Mary Bunning visited Monet’s garden in the little village of Giverny. During the autumn and winter a team of gardeners and volunteers will have been working away in a very special garden. Shrubs and roses will have been pruned, borders tidied, hundreds of bulbs planted, seeds sown, restoration work carried out. For this garden which re-opened on 22 March will be visited by thousands upon thousands of visitors before it closes again for its winter rest on 1 November 2019. The garden, arguably the most famous garden in the world is Monet’s garden at Giverny. One day the Impressionist artist Claude Monet spotted a farmhouse with grey shutters in approximately one hectare of land; it appealed to him so much that in 1883 he leased it, buying it outright in 1890. It was to be his family home for over 40 years. He had the land cleared including the removal of a small avenue of pine trees – apart from leaving two yew trees close to the house; plans were drawn up, flowerbeds were dug, a massive metal archway was erected, and plants purchased – some from as far away as Japan. Near the house a kitchen garden was laid out, including a corner where hens could lay their eggs and scratch in the dirt. The garden became known as Clos Normand. In high summer when I was there the flower beds were a glorious riot of colour from dahlias, roses, hollyhocks, daisies and poppies, interspersed with occasional fruit and ornamental trees – adding height and impact. You will not find regimented ranks of plants in this garden. 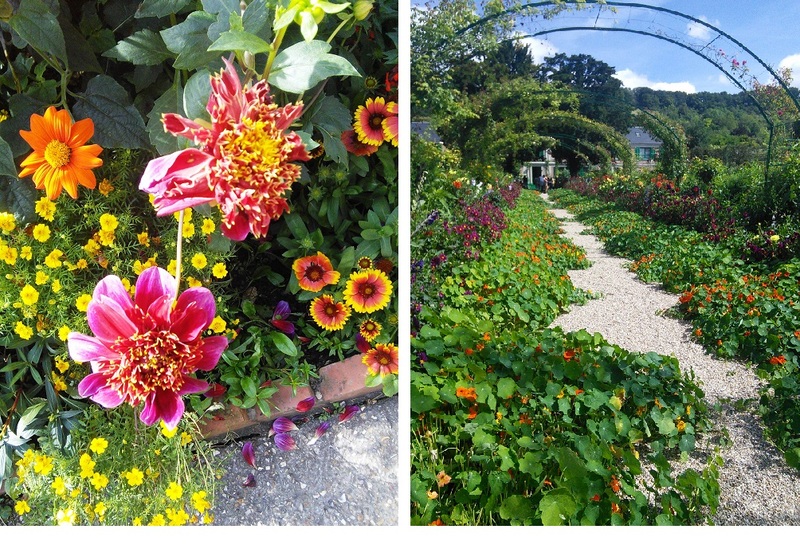 Monet favoured the unrestrained approach to planting: roses ramble over the massive archway; beneath them a carpet of nasturtiums; plants merge and mingle happily together. Yet there is an element of order in the garden – order, for Monet, involved colour and shape, rather than formal lines of plants. As with so many gardeners Monet decided he needed more ground in which to grow the plants he wanted, and loved. He bought another plot of land the other side of the railway track at the bottom of Clos Normand. Today an underground passageway links the two gardens. A small stream divided this plot. Monet had a pond dug out, partly so he could capture the light and reflections in the water. He felt it was nowhere near big enough so the pond was vastly expanded. Monet was fascinated by the prints he had collected of Japanese gardens – a Japanese style bridge was built over the water; a thicket of bamboo was planted; wisteria, weeping willows and water lilies were introduced. He loved both of the gardens, and both gardens were inspiration for his paint brush, but this idyllic, romantic water garden was to become the inspiration for some of his most famous works – the beautiful, evocative water lily canvases. Monet had a large studio built near the house (it is now the shop) to accommodate some of his massive paintings. However, for him it was the gardens themselves that were really his studio – albeit an outdoor studio. Monet’s house is worth a visit too, though be warned the rooms can be incredibly crowded. It’s a remarkably long house. Monet added two wings to the original building and had the outside of the house painted pink and those grey shutters green. He added a long veranda, a pergola and Virginia creeper to complement and link in with the garden. The house, like the garden, is full of colour. 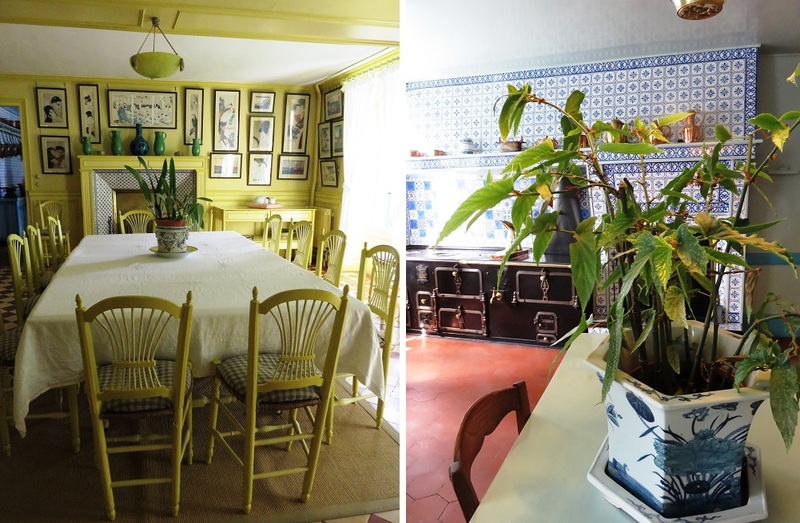 Monet loved colour, as the restored rooms in the house bear witness. Walls of vibrant yellow, mid blue, dusky pink, rich cream, sometimes with furniture painted to match, gorgeous blue and white wall tiles, ochre coloured floor tiles. On the walls hang reproduction Impressionist paintings, plus Monet’s superb collection of Japanese prints. For various reasons the house and garden fell victim to ruin and decay after his death, but eventually sufficient funds were gathered to restore them. It was a project that was to take three years to complete – opening to the public in 1980. Whilst the house has been restored as faithfully as possible, the gardens, as all gardens do, have evolved over the years. Nevertheless Monet’s favoured red geraniums are still planted in front of the house and his ethos and spirit live on throughout the garden in the positioning of the plantings their colours and shapes.